Our Spill Pallet Plus offers a low 8 3/4" profile positions drum funnels below eye level - significantly reduces the potential for hazardous fluids to splash into the eyes or face. Nearly 50% lower than standard spill pallets, drum handling is safer and less strenuous. For safely handling toxic materials. Large sump capacities meet EPA Container Storage Regulation 40 CFR 264.175 and Uniform Fire Code Spill Containment Regulations. 4' thick decking (Which no one else has). Eagle shows many of their decks (two or four drum) with 55 gallon drums on them while the decks do not meet the minimum 66 gallon containment requirement. Our spill containment pallet plus reduces the potential for fluids to leak on surface. 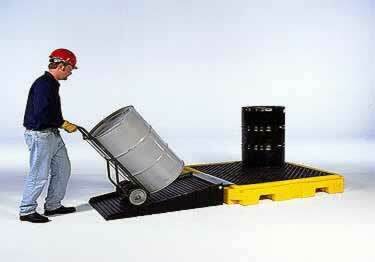 Lower then standard spill containment pallets reduces the strain when drum handling.